As a leading innovator in cable management, Metsec has utilised a non-destructive assembly process to provide the efficiency and cost-effectiveness of pre-galvanised assembly, while guaranteeing the strength and anti-corrosion protection of the product. Download our preGalv ladder brochure for more information. Made from pre-galvanised steel grade S280 with a 275g/m² zinc coating. Metsec’s team of specialist engineers manufacture flat bends, tees & crossovers, risers, reducers and covers, all designed to fit into a complete ladder system with a range of accessories for ease of installation. The PreGalv Ladder’s standard rung configuration is open faced, with rungs alternately orientated up and down at 300mm spacings. PreGalv ladders with all rungs facing upward or downward can be manufactured upon request. For projects requiring long, straight runs of cable ladder, lengths of up to 6m can be manufactured to order. Aesthetically superior to traditional hot dipped finish. Splice plates are supplied complete with M10 cup square bolts, shake proof washers, and nuts with a high tolerance fit for optimum structural performance. Proven to meet recognised industry standards through rigorous BSI Kitemark™ testing, demonstrating safety, reliability and quality. Conforms to BS EN 61537:2007 for cable management, cable tray systems and cable ladder systems. Assembled using a non-destructive process, eliminating any risk of damage to the galvanised coating. 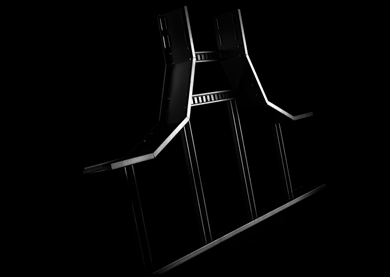 Offers equivalent loading performance of our welded ladder system. Commercial, Education, Health, Oil and Gas, Petrochemical, Power Generation, Retail, Telecoms and Tunnels.